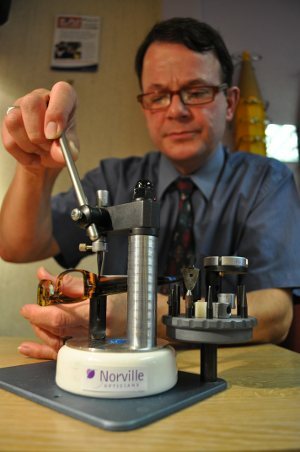 For the month of October Norville Opticians which has practices across South Gloucestershire and Gloucestershire are asking for a donation whenever they carry out an adjustment or a minor repair to someone’s spectacles. The money will help provide eye exams and glasses to children who can’t see to learn at school and adults who can’t see to provide for their families. Optometry Giving Sight is the organiser of the World Sight Day Challenge and jointly collaborates with Vision Aid Overseas in the UK. The funds raised go towards sustainable programs that train local eye care professionals and develop vision centres which provide permanent vision care to people in desperate need. There are 670 million people around the world who are blind or vision impaired simply due to uncorrected refractive error – that’s more than ten times the population of the UK. cause. It’s easy to take vision care for granted here in the UK, so taking the World Sight Day Challenge is a great way to raise funds to give sight to people who don’t have access to the vision care our patients do." The company has been inspired to hear how 9-year-old Nlando’s first pair of glasses will help her see to learn at school. Living in a township in South Africa, where the average family income is just £5.00 per day, education is the only real opportunity she has to escape the cycle of poverty she has been born into. It can cost just £2.50 to provide an eye examination and a pair of glasses in some developing countries. This alone could be enough to save someone from the injustices of poverty. Norville Opticians invite their patients to make a donation at any of their practices during the month of October. Optometry Giving Sight guarantees that 85% of all funds raised by optometrists and their patients go directly to programs that give sight to those most in need. For more information about Optometry Giving Sight and the World Sight Day Challenge, visit www.givingsight.org.